← My bags are already packed! Seattle drivers love Prius cars. As I told you in the past, we Seattleites also love Subaru Outbacks. But we love Prius cars for a different reason. It allows us to be smug. You can see it when you pull up next to a Prius. The driver, and usually the front seat passenger, look over at your idling gasoline car with a look of bemused disdain. Sort of like how knights probably looked down on mud covered commoners as they rode past them on the way to their next crusade. However, this air of environmental superiority might not be quite so pronounced if Prius drivers fully understood the method by which the electricity that powers their “clean” cars was produced. In the U.S., the lion’s share of electricity, over 70%, is produced by burning coal, oil and gas. Less than 1% of electricity in this country is produced from renewable sources. Still, Prius cars are a step in the right direction I guess, and starting next year, you can buy a Prius made in this country. This entry was posted in american made, cars, Made in America, made in usa and tagged Automobile, Made in America, Made in the USA, Prius, Seattle, Toyota Prius. Bookmark the permalink. 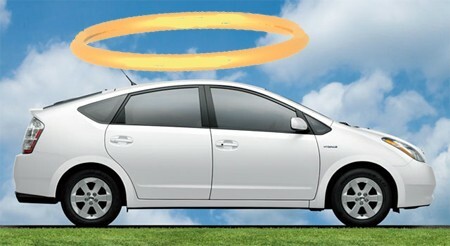 The electricity in a Prius isn’t from the grid… hence not the environmentally unfriendly type of source that you mention. Also, most of the grid source electricty in Seattle area is hydro powered. None are free of negative envrionmental impacts, however. Mea Culpable! It is the Leaf and the Volt that uses grid electricity, not the Prius.